Don’t Help Your Kids With Their Homework is the title of an article that appeared a few weeks ago in The Atlantic. It was written by Dana Goldstein. I’m not convinced that everybody else is wrong and these professors are right, but I’ve ordered the book to see for myself what they have found. 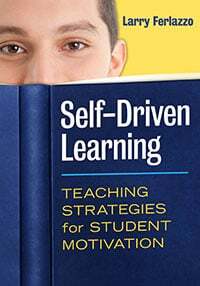 The authors followed that up with a guest column in The New York Times with the decidedly unhelpful headline, Parental Involvement Is Overrated. Inflated Research Claims Can Harm Children: Why “parental involvement” is not a “broken compass.” is a post by Marilyn Price-Mitchell that is also skeptical. Broken Compass authors have a piece in today’s NYTimes. Data is not new, conclusions are misleading. Will be writing a response. Parent involvmt often fails to boost kids’ grades/scores: http://t.co/jDgSUav5li. Unasked (as usual): any effect on kids’ DESIRE to learn? Correlation does not imply causation (parental involvement edition) is from Simply Statistics. The New York Times published three letters to the editor on the infamous “Broken Compass” parent involvement op-ed and book. The first one is good and the second one, by parenting researcher and professor Wendy Grolnick, is excellent. Is Parent Involvement Really a Waste of Time? Recent Polemic versus the Research Record by Mai Miksic is an excellent response to the authors of the Broken Compass book. It was published by the CUNY Institute For Education Policy. NEA Today had an excellent article on the now infamous “Broken Compass” book questioning the value of parent involvement. It quotes Anne Henderson, probably THE parent engagement/involvement expert in the United States. Anne T. Henderson, a senior consultant at the Annenberg Institute for School Reform and a leading expert on the relationship between families and schools, agrees and says Robinson and Harris draw upon a limited body of federal survey data to cobble together some rather expansive and faulty conclusions. While she sees some value in pointing out some of the drawbacks of “garden variety” forms of parental engagement, Henderson cites numerous weaknesses in Robinson’s and Harris’ work, including the absence of any new data collected by the authors, the lack of proper context to a lot of the data (especially around the information provided by parents about their school-related activities) and the obviously flawed use of student test scores as the only measure of success. Henderson also points out that much of Robinson’s and Harris’ works fails to take into account that correlation does not equal causation. Parental involvement overrated? Don’t buy it is a very, very impressive response to the “Broken Compass” authors dismissal of most types of parent involvement. It’s written by three college professors — By Todd Rogers, Lucas Coffman and Peter Bergman — and appeared on the CNN website. Citing their research, the authors of the Times piece, Keith Robinson and Angel L. Harris, describe provocative findings that show that students of parents who are very involved in their children’s education perform worse than students of parents who are less involved. While the authors control for certain variables, their research only implies there is a relationship between parental involvement and student performance. This caveat is important; the existence of a relationship does not tell us what causes what. Think of it this way: If you had two children, and one was getting A’s and the other C’s, which of them would you help more? The C student. An outsider, noticing that you’ve spent the school year helping only one of your children, might infer that parental help caused that child to earn lower grades. This of course would not be the case, and inferring causation here would be a mistake. Does Family Engagement Matter? is a response to the now infamous “Broken Compass” book questioning the usefulness of parent involvement. It’s written by three of the top experts in the field – Karen L. Mapp, Anne T. Henderson, and Nancy E. Hill. The School Community Journal is a must-read for anyone involved in parent engagement activities, and you can access the new issue online here. I’m particularly impressed with Lee Shumow’s critique/review of the infamous Broken Compass book which leads off the issue. Jay P. Green, with whom I often disagree (but not this time! ), has written an excellent review of the infamous “Broken Compass” book on parent involvement titled Wrong Diagnosis on Homework Help from Parents: Authors find correlation, mistake it for causation. After examining more than 300 pages of The Broken Compass with its dozens of regressions and charts, I know no more about the causal relationship between parental involvement and academic progress than I did before. If the purpose of The Broken Compass were simply to raise questions about this inverse correlation, it might be a fine book. But when the authors and unthinking reporters use it to recommend that parents stop helping kids with homework, they are being irresponsible, no less so than advising sick people to avoid hospitals because they tend to kill you. I’ll be adding more to this list. 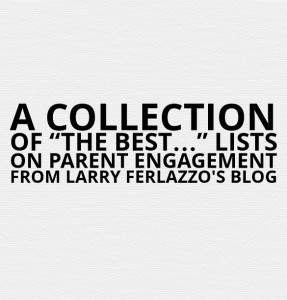 And I’ll be adding this post to A Collection Of “The Best…” Lists On Parent Engagement. This entry was posted in Best of lists, research. Bookmark the permalink.